They're big and they're hairy. They're scary-looking enough to have starred in a number of monster movies, and yet they're popular as pets. But do they sleep? As much as the tarantula is a part of our popular culture, surprisingly little is known about the sleep habits of this follicle-enriched super spider. Tarantula is the name given to several species of large, hairy spiders located throughout North and South America. The bodies of tarantulas have been known to grow up to 3 inches long; leg spans can reach 10 inches. Tarantulas are hunters who prey on other arthropods and, occasionally, small vertebrate animals. Although their bites are painful, most species of tarantulas are not poisonous. They are often kept as exotic pets. No studies have been done to measure the sleep habits of spiders in general or of tarantulas in particular. 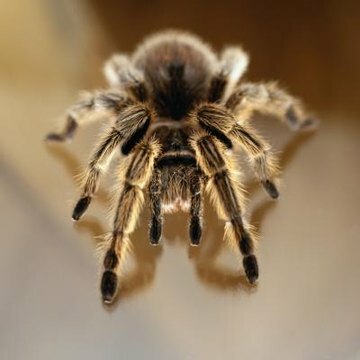 The nervous system of tarantulas is so different from that of mammals that it is difficult to define whether they enter into any type of state that would constitute sleep as we know it. They do, however, appear to experience circadian rhythms that delineate periods of rest and activity. Tarantulas tend to be more active at night, when they leave their burrows to hunt and mate. During the day, they mostly lie dormant inside their burrows, although some have been seen hanging around the opening of their burrows during the daytime on overcast days. Desert species, which live where the light is brightest and the sun is hottest, retreat deep into their burrows during the hottest part of the day but move closer to the opening as dusk approaches. Tarantulas in cooler climates appear to have periods of hibernation during the coldest months, during which they plug up the openings of their burrows with a combination of dirt and webbing. Once their burrows are closed up for the winter, the spiders lie dormant until spring. Very little is known about what they do during this time. In warmer climates, such as in southern Texas, tarantulas never plug their burrows and remain active year round.